With its central London location and proximity to the Houses of Parliament, the Tate was a vulnerable target during the Second World War. Before war broke out in 1939, carefully made plans had been drawn up for the evacuation and safe-keeping of the Collection. 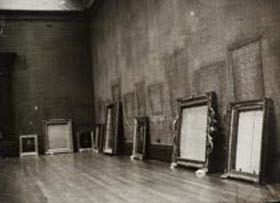 Suitable storage locations for works of art were identified in nearby underground stations and three private country houses - Eastington Hall in Worcestershire, Hellens at Much Marcle in Hereford and Worcester and Muncaster Castle in Cumberland. I welcome the prospect of housing here pictures from the Tate Gallery - in the event of war... their presence here might help preserve us from, or reduce the number of, the threatened hordes of small children. In the early hours of 22 August 1939, Tate Gallery Director Sir John Rothenstein received word of the German-Soviet pact, making war inevitable. He closed the Gallery the same day, and the evacuation of art works began two days later. Larger sculptural works were encased in flame retardant crates and remained in the Gallery along with some paintings which were accommodated in a blast proof storage area in the basement of the building. 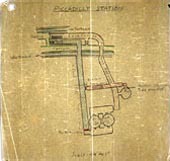 Green Park Underground Station and (from 1941) disused tunnels at Piccadilly, were also used for storage by both the Tate and the Museum of London. The bulk of the Collection however, filling five railway containers, was dispersed to the three country houses accompanied by members of staff to look after the works.